I knew I had to wear my seahorse top I got last summer for nautical week. I was just thinking about how to style it when my striped dress caught my eye. The pink tones look really nice together and the small print on the top doesn't take away from the bright colors of the dress. I can't believe I almost passed this top up! Unfortunately I didn't get a close up of the seahorses, but I promise they are there and it's a nautical outfit! 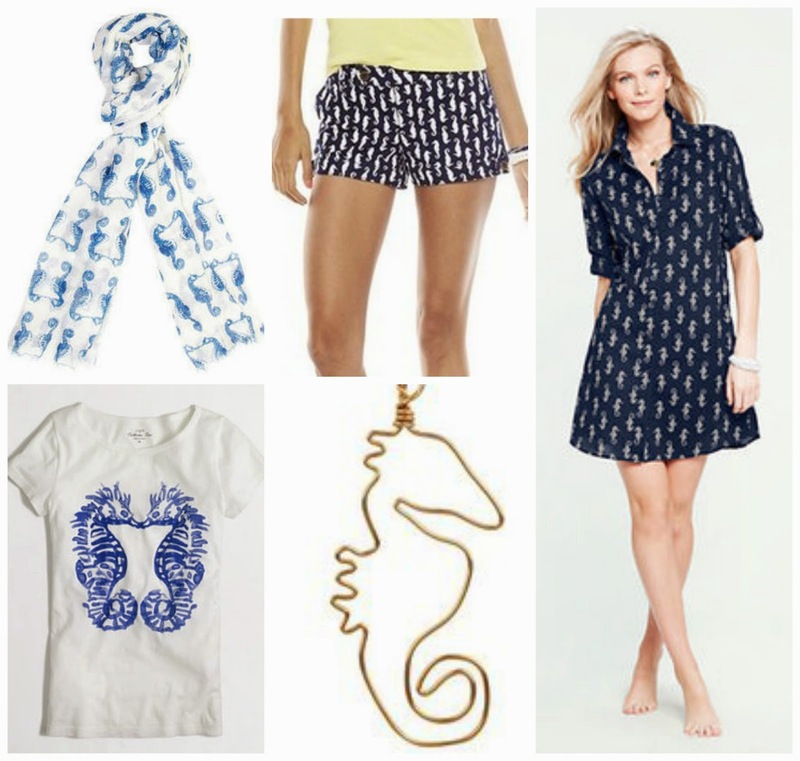 Check out some of these other seahorse items! Don't forget, there is still time to enter the Goody Bag giveaway and a $15 Target giftcard! i want a dang seahorse shirt!! too cute. The little seahorses are the perfect touch - the fact that they are pink just makes them SO preppy, which I love. I love this! That seahorse top is the perfect accent to this dress. Ooh seahorses! So fun! I like the subtle print of the blouse with the bold stripes. Such a good combination. And that dress is awesome. So jealous that you found it on Twice! Nautical week is something I can get behind! I just love the crisp lines and stripes and bright colors! Laura, you always look so pretty! LOVE that dress on you. Oh, I love the seahorses! Too cute! Stripes and seahorses has to be the cutest pattern mixing I've ever seen! Love this look. Did you mean Twice maybe? It's like thredUp, an online thrift store but all brand name. I've found lots of awesome things there and their shipping is super fast! Make sure you get a referral code if you decide to buy anything-$10 off the first time! I love your dress so much! So perfect with your blouse underneath! Such a pretty dress love the colors. Your dress!! Wow what a statement dress! I love the colors and different sized stripes. So so pretty! I love the button-up shirt under it too. Great layering Laura! Super cute look! The belt really helps define your waist- and I like the tie-in of cognac in your shoes too! PS- you are seriously photogenic girl!